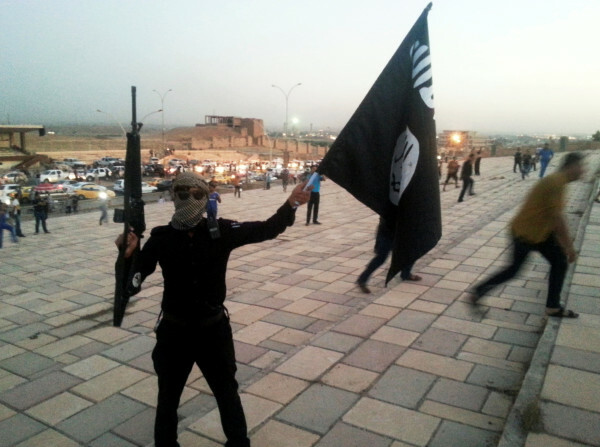 A fighter of the Islamic State group holds an Islamic State flag and a weapon on a street in the city of Mosul in this June 2014 file photo. PORTLAND, Maine — Documents that illuminated a Maine immigrant’s radicalization and 2015 death while fighting for the Islamic State became political on Tuesday, when Gov. Paul LePage called it a side effect of an “inadequate vetting process” for refugees in the U.S.
A closer reading of Iranian immigrant Adnan Fazeli’s case, which was first reported by the Portland Press Herald on Tuesday, doesn’t show that: All indications are that he was radicalized after coming to Maine in 2009. But it illustrates the challenges of fighting online propaganda from the Islamic State, the jihadist group that controls a large swath of Iraq and Syria, especially among Muslims disaffected by American culture. The release of information about the Fazeli case and LePage’s statement coincide with the politics of the man the Republican governor endorsed for president — the party’s nominee, Donald Trump, who on Monday called for an ideological test for Muslim immigrants and visitors. But experts say more restrictive policies could aid terror groups in the end. It’s hard to find red flags that should have been raised about Fazeli pre-2009. A 10-page affidavit filed by George Loder, a Maine State Police detective embedded with an FBI counterterrorism task force, was filed in a federal court last year to obtain a warrant to search Fazeli’s email and Facebook accounts. Unsealed Monday, it paints a complicated picture of Fazeli, who the affidavit says died at 38 in January 2015 while fighting for the Islamic State on the Lebanon border. But the story goes back nearly a decade. Fazeli was from southwestern Iran, where he and his family were ethnic minorities often mistaken for Iraqis. Informants told Loder that in either 2007 or 2008, Fazeli was summoned for arrest by the Iranian government as a dissident. He fled to Syria, and then his family joined him in Lebanon. In 2009, he came to the U.S. as a refugee seeking asylum. He got to Maine later that year. Refugees are screened before they enter the U.S., a process that includes security and medical checks, interviews and cultural orientation classes. But given what we know of Fazeli’s background, it’s no wonder that he wasn’t flagged. But Fazeli had trouble adjusting to life in the U.S. and was apparently radicalized online while in Maine. He converted to Wahhabism, the austere, conservative form of Sunni Islam that inspired the Islamic State, and told an informant that he hated the Iranian government because it’s anti-Sunni and the U.S. government because it “destroyed” Iran. That may conform to research published by the Behavioral Science and Policy Association in 2015: It found that Muslims who are discriminated against or who don’t identify with their original culture or their new culture often feel marginalized and become susceptible to radicalization. In 2011, people noticed a change in Fazeli, who “did not adapt well” to life here: He often watched Islamic videos online and grew a beard, alienating himself from Shiite and moderate Sunni friends in Maine. In August 2014, he left Maine, telling an informant that he was going to the United Arab Emirates to visit his father. He didn’t go there and eventually ended up fighting for the Islamic State on the Lebanese border. This shows how hard it is to fight online radicalization. But Trump’s politics may harm that fight. Fazeli’s not alone, and his case is indicative of a real problem that has helped lead to a partisan political fight. “The foreign terrorist now has direct access into the United States like never before,” he said. And terror attacks led to wrangling over U.S. immigration policy, especially after the I slamic State’s 2015 attacks in Paris that killed 130. Since then, two U.S. attacks — the June shooting that killed 50 at a gay club in Orlando and the December shooting in California that killed 14 — have been attributed to Muslims who were radicalized online. Last year, Republicans clashed with President Barack Obama over the vetting of Syrian refugees, with LePage saying he opposed resettlement in Maine. On Tuesday, he issued a statement saying Obama’s “immigration policies have been an utter failure and continue to jeopardize the safety of millions of Americans.” He called the presidential election between Trump and Democrat Hillary Clinton “pivotal” in fixing those laws. Trump responded to the Orlando shooting by calling for a ban on immigration from Muslim countries with a history of terrorism. In Maine earlier this month, Trump referenced the state’s Somali refugee population before rattling off a list of crimes allegedly committed by refugees. His words have been used in terror recruiting videos. And Robert Morrison, a religion professor at Bowdoin College who focuses on Islam, said while screening is vital, radicalization must be looked at more like other forms of violence — in the context of other experiences in a person’s life.